Everett finished without a catch on one target in a 13-3 loss to New England in the Super Bowl. Everett caught two of four targets for 50 yards in Sunday's 26-23 win over New Orleans in the NFC Championship Game. Everett failed to haul in his only target during Sunday's 48-32 win over San Francisco. Analysis: After recording 14 receptions for 103 yards on 20 targets over the previous three weeks, this was a disappointing showing from Everett. However, a one-game disappearing act shouldn't override the progress the sophomore has made this season, especially since he also played more offensive snaps than fellow tight end Tyler Higbee for the second consecutive week. It's likely Everett's game-to-game inconsistency continues in 2019, but in his third season, there's also breakout potential. 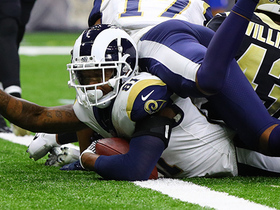 Everett brought in five of six targets for 28 yards and rushed twice for 16 yards in the Rams' 31-9 win over the Cardinals on Sunday. Analysis: Everett continues to progressively carve out a larger role in the offense, as he now has 14 receptions (on 20 targets) for 103 yards to go along with Sunday's two carries over the last three games. The 24-year-old's bump in usage has largely come in the absence of Cooper Kupp (knee), and all signs is that it will continue into Week 17 against the 49ers and through the coming postseason. Everett caught a season-high five passes for 46 yards during Sunday's 30-23 loss to Philadelphia. Everett caught four of seven targets for 29 yards during Sunday's 15-6 loss to Chicago. He also played 36 of 63 offensive snaps. Everett played 24 of 69 offensive snaps and caught one of three targets for seven yards during Sunday's 30-16 win over Detroit. Analysis: Everett was gaining momentum with multiple receptions in three consecutive games heading into last week's bye, so his Week 13 showing was disappointing. He projects as a perfect fit for head coach Sean McVay's offense and has three receptions of over 20 yards through the past five games, so there's definite potential. It just seems more likely that he makes a consistent fantasy impact in future years and not over the final games of the 2018 season. Everett caught three of four targets for 49 yards and two touchdowns in Monday night's 54-51 win over the Chiefs. 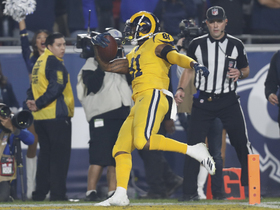 Analysis: Everett was the hero Monday night, scoring both his touchdowns in the fourth quarter when the Rams were trailing. His first came on a seven-yard pass midway through the final period, and his second proved to be the game-winner, as he hauled in a 40-yarder along the sideline and tip-toed his way to pay dirt with under two minutes remaining. In doing so, Everett has now scored all three of his touchdowns this season over the Rams' last two games, sending him into their bye week on a high note. Everett hauled in both of his targets, picking up 15 receiving yards as well as his first touchdown since Week 13 of last season during Sunday's 36-31 win over Seattle. Everett caught three of five targets for 48 yards during Sunday's 45-35 loss to New Orleans. Analysis: This was Everett's best showing of the season, and he notched a reception of 20-plus yards for the second consecutive week. There's no questioning the sophomore's potential, but until he's incorporated into the offense more consistently, fantasy players will struggle to trust him in the majority of settings. Additionally, Everett played just 18 offensive snaps compared to fellow tight end Tyler Higbee's 42. Everett played just 17 of 78 offensive snaps and caught one of his two targets for 22 yards during Sunday's 29-27 win over the Packers. Everett played just 22 of 61 offensive snaps and lost five yards with his only reception during Sunday's 39-10 win over San Francisco. Analysis: At this stage of the season, it looks like another lost fantasy year for Everett. The tight end owns all the athletic gifts to make an impact, but he's not receiving enough looks in the passing attack with just 13 targets through seven games. Everett still owns some dynasty appeal, but all seasonal expectations for him should be tempered at this point. Everett caught two of four targets for 24 yards during Sunday's 23-20 win over the Broncos. Analysis: The sophomore tight end continues to play fewer offensive snaps than peer Tyler Higbee, with the latter playing 55 to Everett's 21. However, Everett has been more involved in the passing attack with five catches for 48 yards the past two weeks. The next step for the South Alabama product is to showcase the big-play ability -- 15.3 yards per reception -- he flashed as a rookie. Everett remains a long way from being a reliable fantasy option. Everett caught all three of his targets for 24 yards during Sunday's 33-31 win over the Seahawks. Analysis: Not only did the second-year tight end make the most of his 16 offensive snaps Sunday, Everett could also be in line for more work in the passing attack if Brandin Cooks (concussion) and Cooper Kupp (concussion) are forced to miss time. It's still a wait-and-see situation for now, and tight end Tyler Higbee (53 offensive snaps) also continues to receiving more playing time than Everett, so fantasy expectations should remain tempered. Everett played 23 of 55 offensive snaps and caught his only target for 13 yards during Thursday's 38-31 win over Minnesota. Analysis: While this was Everett's highest offensive snap count of the season, fellow tight end Tyler Higbee sustained a knee injury during the game and wasn't available for a stretch. With Todd Gurley and the Los Angeles wide receiver trio (Brandin Cooks, Robert Woods and Cooper Kupp) locked into huge target shares, there are only scraps left for Everett and Higbee. It's currently not a promising fantasy setup for either tight end. Everett caught one of two targets for three yards during Sunday's 35-23 win over the Chargers. Analysis: Everett has yet to live up to his 2017 second-round-pick billing, averaging less than a reception per game. The Rams -- chock full of weapons -- haven't had much use for their tight ends this season with targets needed for Brandin Cooks, Robert Woods and Cooper Kupp. Everett's not worth considering, particularly against a tough Minnesota defense Thursday. Everett recorded a 17-yard reception during Sunday's 34-0 win over Arizona. Everett (shoulder) isn't listed on the Rams' Week 1 injury report Thursday, Myles Simmons of the team's official site reports. Analysis: Expected to challenge starter Tyler Higbee for reps at tight end this season, Everett instead spent the bulk of training camp and the entire preseason recovering from an unspecified shoulder injury. At one point, Everett was seen with a sling on his left arm during a practice session. With the season opener days away, he has reached 100 percent health -- or at least enough to avoid the injury report -- but the past month may have put a damper on his ability to produce early on. Everett (shoulder) is working towards a Week 1 return, Myles Simmons of the Rams' official site reports. Analysis: Everett's shoulder injury has lingered for the larger part of August and seemingly could affect his chances of playing in Week 1. The injury has caused some concern due to the prolonged recovery time, but coach Sean McVay feels that barring any setbacks, Everett will be ready to go for the regular-season opener. Everett (shoulder) is not practicing Saturday, Rich Hammond of the Los Angeles Daily News reports. Analysis: Everett, who's been diagnosed with a sprained shoulder, was seen Saturday with a sling supporting his left arm, making it seem as if the he isn't particularly close to practicing at this juncture. With Everett sidelined, Tyler Higbee will continue to serve as the Rams' unquestioned No. 1 tight end until further notice. Everett has been diagnosed with a shoulder sprain and could miss at least a week, Rich Hammond of the Orange County Register reports. Analysis: Everett sustained the minor shoulder injury at some point during the past week of training camp, but the backup tight end isn't dealing with an issue that could put his Week 1 availability in jeopardy at this point. With Everett sidelined and essentially considered day-to-day, Temarrick Hemingway and Henry Krieger-Coble could see additional reps at tight end behind starter Tyler Higbee. Everett is dealing with a shoulder injury, the severity of which is unknown, Rich Hammond of the Orange County Register reports. Analysis: Everett is currently listed as No. 2 on the tight end depth chart behind Tyler Higbee, but could be in for a bigger role this season as he gets more and more used to playing the position at the professional level. 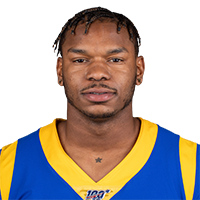 Head coach Sean McVay has touted Everett's potential to be an asset in the Rams' offense, so hopefully his shoulder injury isn't of major concern. Everett has over a month to get healthy before regular season play begins. Everett could take on a larger role in his second season, Myles Simmons of the Rams' official website reports. 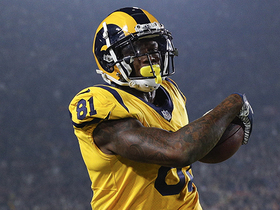 "Gerald is a guy that has a lot of ability," said Rams coach Sean McVay. "I think its continuing to get more comfortable playing the tight end position at the professional level. And we ask a lot of our guys, being able to play in the run and the pass game, and sometimes compete in protection, and Gerald's a guy that I think he's going to attack the offseason the right way and we're hoping to see him continue to improve." Everett played just 21 of 68 offensive snaps and caught one of two targets for only four yards during Saturday's 26-13 loss to Atlanta in the wild-card round. Everett caught just three of six targets for 16 yards and lost a fumble during Sunday's 34-13 loss to San Francisco. Everett played 18 of 58 offensive snaps and caught two of four targets for seven yards and a touchdown during Sunday's 32-16 win over Arizona. Everett caught one of two targets for eight yards during Sunday's 24-7 loss to Minnesota. Analysis: The rookie tight end was on the field for just 19 of 59 offensive snaps, as Tyler Higbee continues to receive more playing time. As a result, it's difficult to rely on Everett in any seasonal fantasy setting. However, the South Alabama product is definitely still a solid prospect to consider stashing in deep keeper/dynasty leagues. Everett played 20 of 66 offensive snaps but didn't haul in either of his targets during Sunday's 33-7 win over Houston. Everett hauled in one of his two targets for a 44-yard reception during Sunday's 51-17 win over the Giants. Analysis: It's pretty clear at this stage of the season that Everett is both tremendously talented and unlikely to receive consistent looks in the passing attack. The rookie tight end was on the field for just 15 of 64 offensive snaps, whereas sophomore Tyler Higbee played 50. As a result, Everett's fantasy value is extremely limited. Still, with Jared Goff proving capable of running a high-octane offense, Everett has plenty of long-term appeal in deep keeper/dynasty settings. 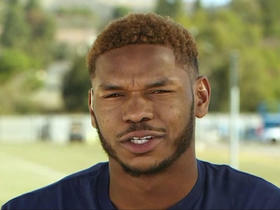 Los Angeles Rams tight end Gerald Everett joins "Up To The Minute" to discuss their upcoming matchup against the Dallas Cowboys. 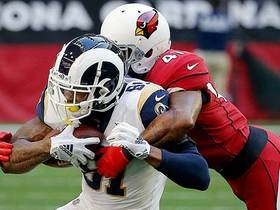 Los Angeles Rams tight end Gerald Everett catches a short pass for a first down and goes face-to-face with Arizona Cardinals safety Antoine Bethea. 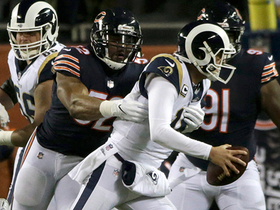 Los Angeles Rams quarterback Jared Goff throws it away as Chicago Bears linebacker Khalil Mack swings him down. NFL Network's "NFL Fantasy Live" crew highlights six players you should target on the waiver wire in Week 13. 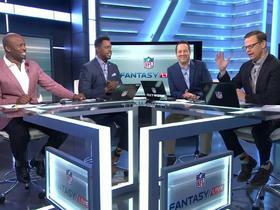 NFL Network's 'NFL Fantasy Live' crew discusses the fallout from the Los Angeles Rams high-scoring win over the Kansas City Chiefs on Monday Night Football in Week 11. 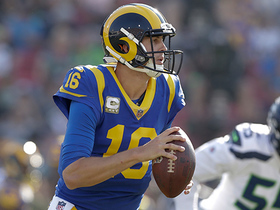 Los Angeles Rams quarterback Jared Goff passes 40-yard touchdown to tight end Gerald Everett. 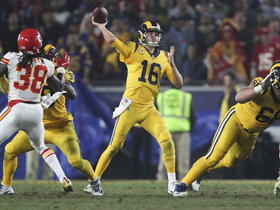 Los Angeles Rams quarterback Jared Goff throws 7-yard pass to Gerald Everett for his third TD throw of the night. Los Angeles Rams quarterback Jared Goff throws a laser pass over the middle to tight end Gerald Everett for a 10-yard touchdown. 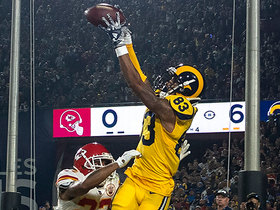 Los Angeles Rams quarterback Jared Goff throws a screen pass to tight end Gerald Everett and Everett dives into the end zone for a two-point conversion.